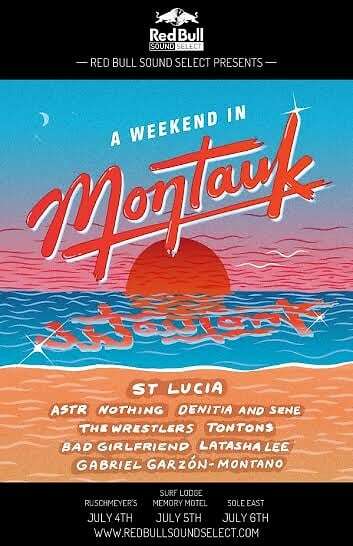 This weekend, Red Bull Sound Select is presenting A Weekend in Montauk featuring headliner, St Lucia. The event will showcase a number of Red Bull-curated artists including Astr, Nothing, Denitia and Sene, Wrestlers, The Tontons, Bad Girlfriend, Latasha Lee & The Black Ties, and Gabriel Garson-Montano. The three-day music event will take place at some of the staple hot spots in Montauk. Prepare for this debut to be filled with live music, amazing cocktails and picturesque sunsets. RSVP HERE for a chance to win a limited edition Wampum X Sound Select bracelet!